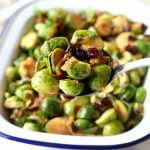 These Brussels Sprouts are roasted with caramelized onions, sweet cranberries and nutty pistachios for a delicious side dish that's easy to make! Heat a large cast iron or other heavy bottomed-skillet over medium heat. Add the butter to the pan and let it melt until it begins to sizzle. Add the sliced onions and toss them in the butter until they're coated. Saute the onions in the butter for a few minutes, stirring every so often to make sure they brown evenly. Turn the heat down to low and let the onions caramelize in the butter, stirring every minute or so until the slices of onion turn a deep brown colour. Add the apple juice, halved Brussels sprouts, the dried cranberries and the salt and pepper and stir the mixture around in the pan until the Brussels Sprouts begin to soften just slightly. Cover the pan. Let the Brussels sprouts cook, covered, for about 7-9 minutes, stirring every 1-2 minutes or so. If you'd like them to be a little softer continue cooking for a few extra minutes until they're done the way you like them, but we prefer them just soft enough to eat. Because the Brussels sprouts are halved they'll cook a little bit faster and they'll also fall apart a bit which creates a beautiful and rustic presentation. The dried cranberries also re-hydrate a little bit with the addition of the apple juice and as the Brussels sprouts release their juices. Transfer the Brussels sprouts to a serving dish and sprinkle the chopped pistachios over the top. Serve alongside your favourite holiday main dishes at your next Thanksgiving or Christmas party, or enjoy them as a quick midweek side dish with your family!